This report provides (1) an overview of Cuba’s purchases of U.S. agricultural, fish, and forestry products since 2000; (2) an analysis of the effects that U.S. government restrictions on export financing terms and travel to Cuba by U.S. citizens have on those Cuban purchases; and (3) estimates of likely U.S. agricultural sales if export financing restrictions and travel restrictions are lifted. The report was prepared in response to a request from the Senate Committee on Finance. To perform its analysis, the Commission relied upon Cuban production and consumption data as reported to the United Nations; reported world exports to Cuba; official Cuban statistics on production and trade; official data on U.S. exports to Cuba; interviews with the principal U.S. exporters and shippers to Cuba; academic studies; testimony at the Commission’s public hearing; written submissions; and staff travel to Cuba. 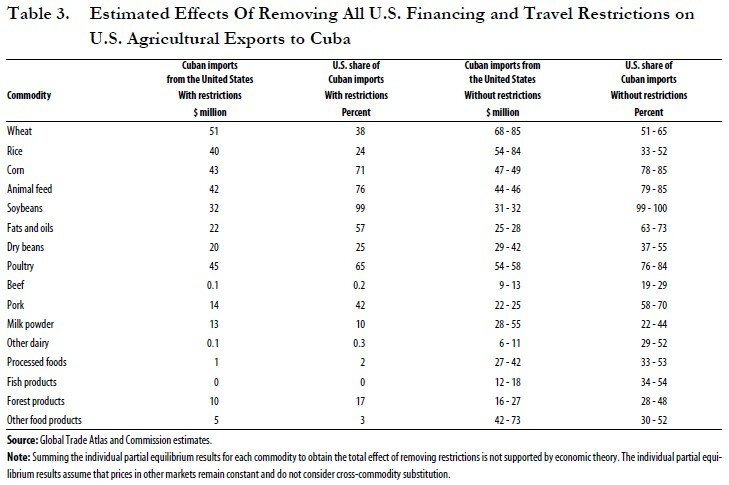 To assess the effects on U.S. agricultural exports and on travel to Cuba, the Commission used two economic models: one to estimate the effect of lifting restrictions on U.S. citizen travel to Cuba, and another to estimate the effect that U.S. financing restrictions have had on U.S. agricultural exports to Cuba and the stimulus that additional travel by U.S. citizens to Cuba would have on the Cuban demand for U.S. agricultural exports. The Commission assumed no change in current U.S. investment policy towards Cuba (i.e., U.S. investment in Cuba remains prohibited) nor did it assume any policy changes within Cuba. Because of data limitations and the non-market aspects of Cuban purchasing decisions, the overall effect of removing all statutory restrictions on U.S. exports to Cuba is difficult to quantify. However, based on interviews with Cuban purchasing officials, sector modeling results, and discussions with U.S. industry officials, the Commission estimates that the U.S. share of Cuban agricultural, fish, and forest product imports would rise to between one-half and two-thirds. Financing restrictions raise Cuba’s cost of purchasing U.S. products. Many of these costs are difficult to measure precisely. Therefore, Commission estimates of financing restriction effects are presented in the form of ranges. Staff interviews and analysis indicate that such costs range between 2.5 to 10 percent of the purchase price depending on the commodity sector. 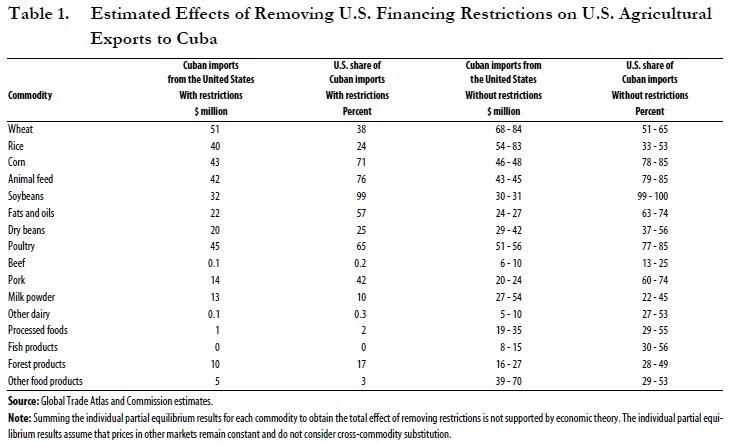 All agricultural commodity sectors would likely benefit from the lifting of the financing restrictions on U.S. agricultural exports to Cuba (Table 1). Among the sixteen commodity groups examined, the largest gains in U.S. exports to Cuba were for other food products, including fresh fruits and vegetables (a rise of $34 million to $65 million annually), milk powder ($14 million to $41 million), processed foods ($18 million to $34 million), wheat ($17 million to $33 million), and dry beans ($9 million to $22 million). 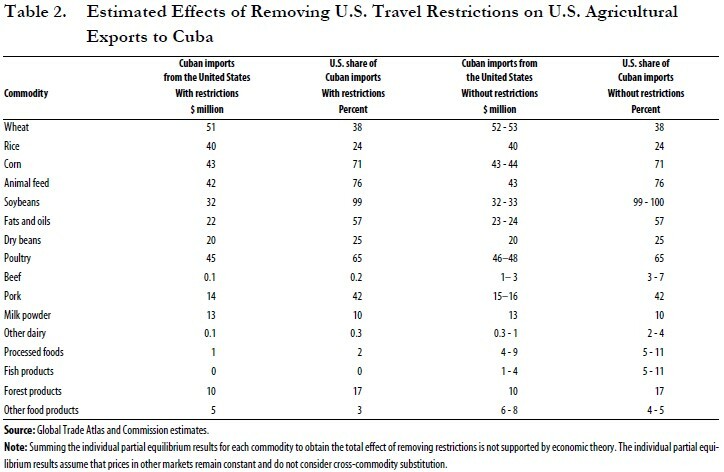 If restrictions on travel of U.S. citizens to Cuba were lifted, among the sixteen commodity groups examined, measurable gains in U.S. exports to Cuba were for processed foods (a rise of $3 million to $8 million), poultry ($1 million to $3 million), beef and pork (each gaining $1 million to $2 million), and fish ($1 million to $4 million) (Table 2). These are sectors where a large share of imports are distributed to the tourism sector. U.S. agricultural exports of most bulk products, including wheat, rice, corn, animal feed, soybeans, dry beans, forest products, and milk powder will experience virtually no gains owing to increased visits to Cuba by U.S. tourists, since only a negligible fraction of these Cuban imports are consumed in the tourist sector. Eliminating financing restrictions on U.S. agricultural exports would likely have a larger impact on U.S. agricultural sales than lifting the travel restrictions on U.S. citizens (Table 3). This is because most imported food from the United States consists of bulk commodities sold to Cubans, rather than foods that are sold to tourists. If restrictions on financing of U.S. agricultural exports and on travel of U.S. citizens to Cuba were both lifted, the largest gains in U.S. exports to Cuba among the sixteen commodity groups examined were for other food products (including fresh fruits and vegetables) (a rise of $37 million to $68 million annually), milk powder ($15 million to $42 million), processed foods ($26 million to $41 million), wheat ($17 million to $34 million), and dry beans ($9 million to $22 million). In 2000, U.S. agricultural exports to Cuba were negligible. Following implementation of the Trade Sanctions Reform and Export Enhancement Act (TSRA) of 2000, U.S. exports grew rapidly so that by 2004 the United States was the largest supplier of agricultural products to Cuba. In that year, Cuba imported $392 million in agricultural goods from the United States, equivalent to 42 percent of its total agricultural imports. The increase in U.S. exports to Cuba coincided with weather-related production declines in Cuba which necessitated increased imports. The majority of Cuban imports from the United States are consumed by Cuban citizens, with a small share going to the tourist market. The value of Cuban agricultural imports from the United States dropped by 10 percent in 2005 and a further 4 percent in 2006. A change in U.S. Department of Treasury, Office of Financial Asset Control (OFAC) financial transaction rules in March 2005 which require the seller to receive payment from the Cuban buyer before vessels carrying goods leave the U.S. ports, may partially account for this decline. Other factors also may have been important, such as OFAC’s changes to U.S. regulations on Cuban remittances and favorable credit terms offered by U.S. competitors in the Cuban market, and an overall decline in imports in 2006. All Cuban imports of agricultural products from the United States are controlled by a state-trading entity, Alimport. Several factors, both economic and noneconomic, are considered by Alimport in its food purchasing decisions. Therefore, even though the United States is, for many products, the most competitive supplier for Cuba in terms of price, quality, and delivery terms, Alimport considers non-commercial factors such as diversifying import suppliers, strengthening strategic geo-political relationships, and influencing the political debate over sanctions in the United States. Purchases are also allegedly geared to particular U.S. States or Congressional districts in an effort to heighten local interests in pressing the Administration to normalize trade with Cuba. Opinions on the effect of business travel and export financing regulations on U.S. exporters are mixed. Larger exporters (e.g., multinational commodity trading companies) that account for the vast majority of agricultural exports characterize the extra financial costs and the burden of obtaining travel licenses to conduct business in Cuba as small. In contrast, exporters with small sales volumes and new entrants characterize the process as non-transparent, timeconsuming, expensive, and in some cases, a reason not to trade with Cuba altogether. While several U.S. industry officials indicated that their applications for travel licenses were initially denied, or took more time to process than expected, none indicated that they were ultimately unable to obtain travel licenses. U.S. regulations, especially financing regulations imposed after March 2005, which require the seller to receive payment from the Cuban buyer before vessels carrying goods leave the U.S. ports, reportedly increased the cost of U.S.-Cuba trade for both U.S. exporters and Alimport. This has made U.S. products less competitive relative to imports from other sources. Many U.S. exporters view OFAC’s decision requiring that payments be made through letters of credit drawn on third-country banks as an impediment to sales to Cuba. Furthermore, the OFAC rule change disrupted U.S. exports to Cuba during late 2004 and early 2005 that were already under contract and/or in transit. OFAC appears to have restricted business travel to and from Cuba that is necessary for U.S. exporters to effectuate sales. Particularly important are Cuban officials traveling to the United States to inspect U.S. processing facilities, U.S. port facilities, fresh produce, live animals, and other products subject to sanitary and phytosanitary standards. For many of these products, restricting business travel effectively bars U.S. sales to Cuba. OFAC restrictions on maritime shipping of U.S. products to Cuba significantly increased freight charges for cargo to Cuba above freight charges to other Caribbean destinations. U.S. restrictions on travel to Cuba limited the number of Americans traveling to Cuba to fewer than 200,000 in 2005 and reduced the amount of U.S. dollar remittances to Cuba from Cuban-Americans. A large proportion of these remittance dollars received by Cuban citizens are spent on U.S. agricultural products. Many Americans express interest in travel to Cuba, according to the American Society of Travel Agents, and U.S. travel to Cuba would increase markedly in the absence of sanctions. Cuba is increasingly able to meet U.S. tourist demand, owing to the addition of hotel capacity and recent improvements in tourism services and facilities. The Commission estimated that without the travel sanctions, travel by Americans to Cuba would increase from 171,000 to between about 554,000 and 1.1 million in the short term. Since these American visitors could, to some extent, displace current foreign tourists in Cuba, the net effect in the short term is a potential annual increase in additional tourist visits to Cuba of between 226,000 and 538,000. In 2006, the total number of visitors to Cuba was 2.2 million. Additional tourist arrivals would increase U.S. sales of agricultural goods to Cuba because of the increased tourist demand for food and because of higher Cuban economic growth boosting domestic demand for high quality U.S. food products. 1. This is the executive summary of U.S. International Trade Commission report, U.S. Agricultural Sales to Cuba: Certain Economic Effects of U.S. Restrictions, USITC publication 3932, July 2007, and is available from www.usitc.gov. The report and summary are available without copyright protection. John Reeder and Joanna Bonnarriva, project leaders; Roger Corey, Andrew Gateley, Brad Gehrke, Fred Forstall, John Fry, Vincent Honnold, Joseph Kowalski, and William Deese, principal authors.